After purchasing your carving, we suggest you go with our 1, 1, 1 plan! Coat the carving in one week, one month, and at one year and every year after as needed! Don't forget to coat the base but NOT underneath the base. Direct Sunlight and dry places (next to a heater) are not good for a wooden sculpture. Keep your sculpture at least one half inch off of any surface (ground/floor). Bricks, rocks, coasters etc can be used for this purpose. The above steps will help reduce the likelihood of large cracks but does not exclude. Wood Checking (cracking) is a natural tendency of wood, whether seasoned or green, once you cut it, it will begin to check. It occurs because of moisture coming and going; the log breathes. This is due to humidity changes and is in no way considered a defect. If the wood sculpture is kept in a stable environment and is treated well with urethane, it can reduce the likelihood of checking but does not exclude. Logs are a natural element, we can not guarantee their future properties once sold. When your carving checks, you have numerous options. Enjoy the beauty of the wood sculpture as a natural element and leave the check. Or, choose from the options below. If your carving is painted a solid color, you can use indoor/outdoor caulking to fill the check and easily paint over it to match the existing color paint. More specifically, 99 cent spray paint from Lowes or Wal-mart can be used, along with Alex Plus Brilliant White caulking from Lowes for $1.28. I'm sure other brands will also work. If your carving is natural wood color, Wood Putty or Epoxy can be placed in the check and refinished with Stain/Polyurethane or Spar Varnish by Cabot. Wood Shims can be placed in the check, sanded smooth, and refinished with Stain/Polyurethane or Spar Varnish by Cabot. Quick fix; reapply stain/color or paint/Polyurethane in the crack so that it blends in with the rest of the sculpture. 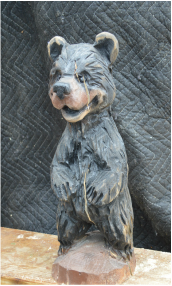 You may also contact us to repair your wooden sculpture for a small fee. Enjoy your wooden sculpture! It is one of a kind! Here is a small bear with a few checks in it. I just wanted to post this as an example of a nicely dried out log. We believe this adds character to the sculpture!